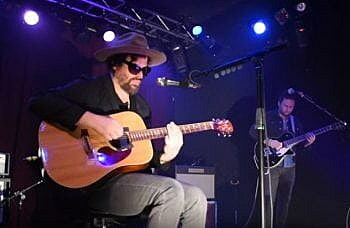 Michael Glabicki of Rusted Root and guitarist Dirk Miller will perform a the Top Hat Lounge in Missoula on October 8. Back in the 1990’s, Glabicki had a vision he was driven to pursue. He left college and started a band despite the fact that he had no idea where the journey would deliver him. He spent two years developing this vision while learning the craft of songwriting. That vision grew into Rusted Root, the multi platinum band out of Pittsburgh, and Glabicki became one of music’s most unique voices. While Rusted Root is on hiatus, Glabicki has been devoting his time to create an entirely new soundscape. Glabicki promises to bring back parts of the Rusted Root of old, but also include more percussion and female vocals. Collectively, the band hopes that the new material will deliver it to a special place. Glabicki will continue to play Rusted Root’s entire catalog but promises to deliver freshly inspired versions, as well as introducing new and exciting music under the moniker of Uprooted.